1. Concerning the Facts: I have known Mrs. Rosa Goldberg, born [Rosa] Mibab, now living in Jacksonville, Florida, U.S.A. since we spent our childhood together in our hometown, as I attended school with her older sister. The Germans invaded the city in 1941 and immediately, in the summer of 1941, imposed severe restrictions on the Jewish population. I had to perform arduous forced labor cleaning streets, laying cables and working in the fields surrounding the city, and Mrs. Goldberg was also forced to work for the Germans. We were heavily guarded by German constabulary, SS, and Ukrainian militia and were at first made to wear white armbands with a blue Star of David and soon afterward a yellow star on the chest and back. In addition, certain parts of the city were completely closed to Jewish people and we had to observe strict curfews. Early in 1942 the Ghetto Wladimir-Wolynsk was completely closed off from the surrounding area, surrounded by a fence, and heavily guarded by SS and Ukrainian militia. The ghetto consisted of a few narrow alleys of the old city, where about 30,000 Jews had to live penned up. We were allotted meager food rations by the Jewish Council, whose chairman was named Kudisch. The German commanders were Klettwig and Keller. 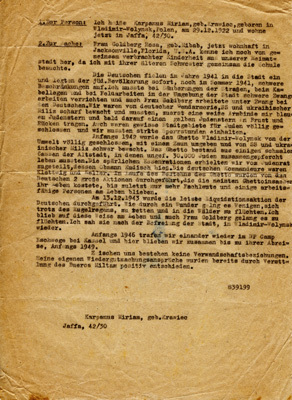 During the course of the ghetto's existence 2 large actions were conducted by the Germans, which cost most of the ghetto's inmates their lives, until finally only experts and a few people who were able to work remained alive. On 12/13/1943 the last liquidating action was conducted by the Germans. As if by a miracle and although it was raining bullets, a few people managed to save themselves and flee into the woods. I survived in this manner, and Mrs. Goldberg also managed to flee. I saw her again in Wladimir-Wolynsk after the city was liberated. At the beginning of 1946 we met again in the Displaced Persons Camp Eschwege near Kassel, and there we remained together until her departure early in 1949. No family relationship exists between us. My own claims toward compensation for my detainment have already been settled through the office of Miltam. 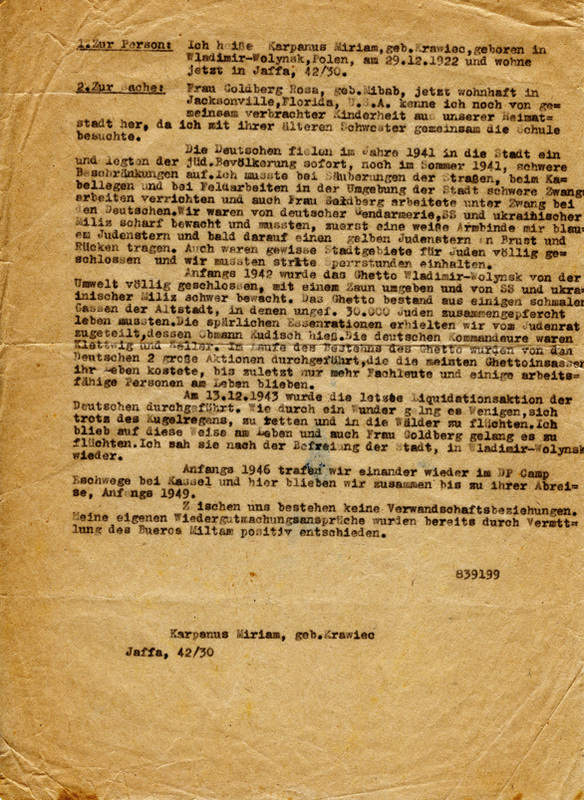 An affadavit from Miriam Karpanus in support of Rosa Goldberg's claim. A translation of this affadavit is on the right.